• First Author’s Affiliation: University College London, London, UK. This paper describes a proposed ESA M-class mission , the 1.5-meter Exoplanet Characterization Observatory (EChO). The idea behind EChO is simple: to provide a dedicated platform for exoplanet characterization, i.e. to figure out what’s in the atmospheres of planets around other stars. Missions like Kepler do a great job at finding extrasolar planets and at estimating their sizes. Most of these worlds can be massed as well, using techniques like radial velocities and transit timing variations. These are fantastic measurements that let us build up a broad picture of the exoplanetary population. However, as Figure 1 shows, mass and radius alone tell us almost nothing about what might be in a planet’s atmosphere, and what conditions on the surface (if it even has one) are like. 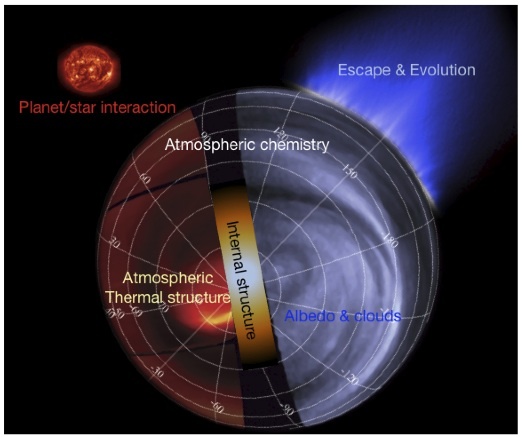 Understanding atmospheric and surface composition is critical to a complete theory of the formation, evolution and dynamics of planets, as well as in determining whether or not they might be habitable. For example, Earth and Venus share similar masses and radii, but life as we know it would be hard-pressed to exist on the lead-melting surface of Venus! 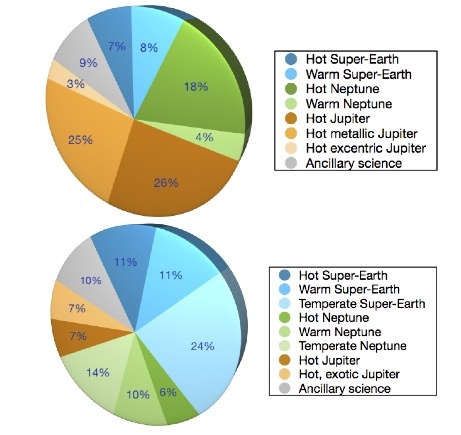 Figure 1: Planets with similar masses and radii can have very different atmospheric structures. Earth and Venus share similar masses, radii and densities, but have very different atmospheres and surface conditions. Jupiter and HD189733b similarly are in the same mass and radius regime, but have different compositional and thermal profiles. Spectroscopy can break the degeneracy and let us figure out what these planets are really like. Spectroscopy allows us to break this degeneracy and directly characterize exoplanets. By looking for the spectral imprint of different substances, we can figure out the composition of the atmosphere as well as its temperature structure (if a feature is observed in absorption, then that substance is hotter deeper in the atmosphere; if in emission, then the opposite is true). EChO proposes to act as the first dedicated platform for exoplanet spectroscopy. We have already learned a great deal about the chemical compositions of exoplanets using existing space-borne missions like Hubble and Spitzer. However, these platforms were designed for the background-limited studies needed for cosmological and galactic studies, not the photon-limited observations that exoplanet characterization requires. By optimizing specifically for the requirements of exoplanet observations, EChO aims to achieve great precision and spectral coverage to facilitate the detailed study of exoplanet atmospheres. The ESA’s M-class program refers to medium-size missions (i.e. sub-flagship size); other examples include Euclid, slated for launch in 2019. EChO is competing for 475 million euros of funding and has a proposed 2022 launch date. EChO will feature a 1.5-meter telescope passively cooled (no moving parts!) to 50K. This stable design is designed to reach a long-term precision of one part in a hundred thousand, or .00001. EChO would be able to look at wavelengths from 0.4-16 microns (redder visible light through IR) with R~50-300 (low-to-medium resolution, good for photon-limited exoplanet studies). This waveband spans 30 key molecular features. 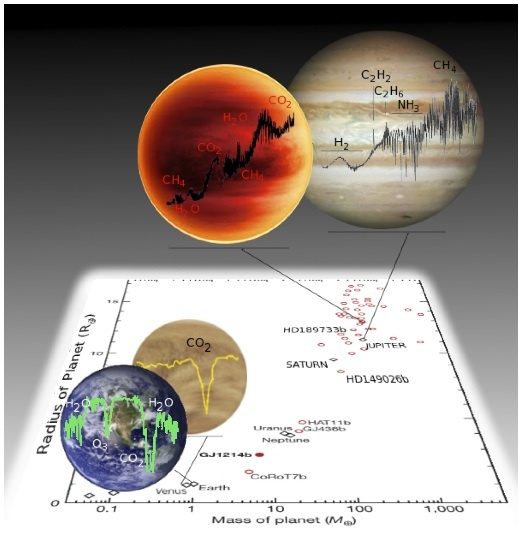 Measuring the atmospheric composition, temperature and albedos of a broad range of exoplanets. Understanding these parameters is key to understanding the energy balance and redistribution mechanisms of planets, as well as to understanding planetary climates. Measuring the spatial and vertical temperature variability on the planet, producing maps of temperature as a function of longitude and vertical height in the atmosphere. This can be used to constrain atmospheric dynamics and general circulation models, as well as assess the roles of photochemistry and the validity of the assumption of thermochemical equilibrium. Understanding planet-star interactions. Detailed long-term observations of stellar variability simultaneous with planet observations will allow these effects to be filtered out more precisely, enabling superior planet characterization. Placing constraints on the models of interior structure through a more detailed understanding of the composition and thermal structure of the planetary atmosphere. Similarly, placing constraints on composition and energy budgets, which will enable the formation location of the planet to be better localized, leading to a better understanding of the composition and evolution of the initial protoplanetary disk. Measuring thermal/chemical variability of non-transiting exoplanets by looking for variation in flux as a function of phase. While not a primary goal., this additional science comes along “for free” with the capabilities required for the other mission objectives. In addition, EChO could be used to search for exomoons as small as 0.33 Earth radii in size via transits, and take the first steps toward looking for possible biosignatures on super-Earths. Figure 2: Graphic showing EChO’s primary science goals. Through transmission spectroscopy (transmission studies of the terminator) it aims to probe internal structure. Through thermal emission spectroscopy (emission studies of the dayside during secondary eclipse) it probes composition and albedo. Detailed time-series data can also inform studies of the planet/star interaction, and in conjunction with the other measurements give information about atmospheric escape. Transmission spectroscopy: When the planet transits the star, the atmosphere leaves a spectral imprint on the starlight passing through. By comparing out-of-transit observations of the star with in-transit observations, the planetary spectrum can be recovered. This technique probes the high reaches of the atmosphere on the day/night terminator of the planet, and gives information about composition and thermal structure. Emission spectroscopy: at the opposite end of the orbit from transit, the planet passes behind the star; this is known as secondary eclipse. By comparing the flux measured just before and just after this event, the light emitted from the dayside of the planet can be measured. This emission is a mixture of reflected light from the star and the reprocessed thermal emission of the planet; at infrared (IR) wavelengths, the flux is dominated by the planetary thermal emission. This technique probes much deeper into the atmosphere of the planet than transmission spectroscopy. Figure 3 shows a simulated emission spectrum that might be produced by EChO. Phase curve maps: As the planet orbits the star, we see differing amounts of its dayside surface (i.e. different phases, as we see with the Moon or Venus). By measuring the flux as a function of orbital phase, an emission map of the dayside can be built up. This allows for detailed characterization of the energy distribution on the planet surface, enabling the study of energy redistribution mechanisms such as planetary winds. For example, a very large temperature fall-off observed from the sub-stellar point indicates poor redistribution, while an atmosphere relatively even in temperature indicates a high degree of redistribution and an atmosphere that is likely well-mixed with strong day/night circulation. 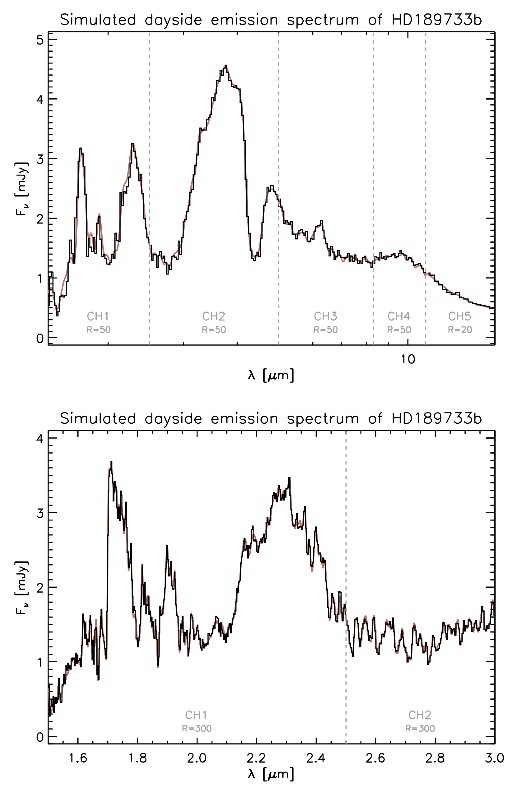 Figure 3: Simulated EChO spectroscopy of the archetypal Hot Jupiter HD 189733b. Note the extraordinary resolution of spectral features, including resolving individual hydrocarbon lines, an as-of-yet unachieved feat. The team projects that obtaining a spectrum with this high of a signal-to-noise ratio would require observing 50 eclipses, corresponding to 8 days of observing time, which would be spread out over approximately 3.5 months. EChO is flux-limited to V-magnitudes of about 12 for Neptune-class objects orbiting G or K stars, and K-magnitudes of about 9 for habitable super-Earths around late M stars. At the present time, there are ~80 transiting exoplanets that would be viable targets for EChO, including several super-Earths, and it is anticipated that many more would be discovered by the time the mission flies. Figure 4 summarizes the expected observing time allocations for different targets. Super-Earths and Earthlike planets would be a priority for EChO and would be allocated more time if more are discovered by the time the mission flies. Figure 4: Proposed allocation of EChO observing time. The top plot assumes the currently known population of exoplanets; the bottom plot assumes the discovery of many more planets in the Super-Earth regime. Observing Super-Earths would be an EChO priority. Note that ~10% of observing time would be dedicated to ancillary science in either case. EChO is projected to be operating simultaneously with NASA’s James Webb Space Telescope (JWST) and large ground-based telescopes like the European Extremely Large Telescope (E-ELT). How will EChO complement these observatories? E-ELT: A 42-meter telescope like the ELT would have much higher resolution and photon-gathering capacity than EChO. However, the limiting factor in exoplanet observations is long-term photometric stability, and due to the atmosphere alone, the ELT would not be able to achieve anywhere near EChO’s precision. Furthermore, absorption from the Earth’s atmosphere would obscure many of the most interesting spectral features (including the very substances that are the strongest indicators of habitability and possible life! ), rendering them unobservable from the ground. JWST: JWST would have greater collecting area, and hence sensitivity and resolution, relative to EChO. However, JWST is again optimized for background-limited, faint observations, not long-term photon-limited ones. It would consequently be unable to match EChO’s long-term sensitivity of 1e-5. Furthermore, JWST would not be able to achieve simultaneous coverage across the full 0.4-16 micron band spanned by EChO; thus, in order to cover the same wavelength range, many more orbits and observations would be required. Finally, with ~85% of JWST’s observing time dedicated to non-exoplanet targets, it would be very hard to schedule the repeated transit and eclipse observations of a planet required to drive up the signal-to-noise and derive high-fidelity observations of exoplanet atmospheres. Exoplanet research has moved beyond planetary censuses. A dedicated exoplanet atmospheres observatory like EChO will be an essential part of the next generation of exo-atmosphere characterization.